In the past metal roofs were not considered to be traditional roofing. However, they are gaining in popularity because of their features. Metal roofs, as shown in Figure1, are durable, very lightweight, maintenance free, fire retardant and energy efficient. Metal can be formed to imitate the appearance of almost any other style roofing. Metal roofs have a life expectancy exceeding 30 years and some manufacturers offer a lifetime warranty. 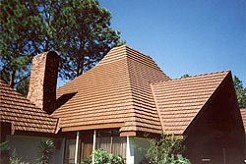 Figure 3 - Metal roof that looks like clay tiles. Basic metal roofing material costs substantially more than shingle roofing material, from $100 to $600 per square (100 square feet). 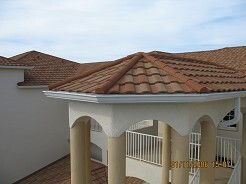 With premium metal roofs, comprising coated steel and copper costing substantially more. The installation cost for metal roof ing material is also more expensive than the installation cost for applying shingles to a roof. However, because metal roofing can be installed over multiple layers of old shingles the expense of removing and disposing of the old shingles can provide a substantial reduction in the total metal roof project cost. Note: Damaged roof structural support such as broken rafters, trusses or damaged sheathing material must be replaced or repaired prior to the installation of a metal roof. The metal roof material itself does not provide a fix to structural problems. 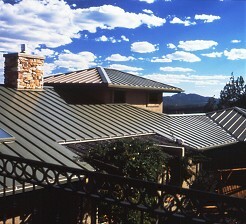 Painted aluminum and steel are currently the two most popular choices for metal roofing, as shown in Figure 2. Aluminum and steel offer the benefits of durability coupled with a lightweight. Both steel and aluminum have been formed to have the appearance of clay tile (Figure 3) or slate without the requirement to add support to the roof rafters in order to install the actual tile or slate. While copper and stainless steel provide very rich appearances, they are expensive. The transformation of aluminum into visually effective cedar shakes, slate, and clay tiles, coupled with the facts that it does not rust, and actually reduces the sound of rain is quickly making it the number one choice in metal roofing. 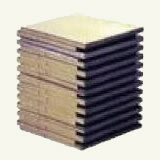 Leading the market are the simulated cedar shakes, as shown in Figures 4 & 5, which are, for all intent purposes, indistinguishable from actual cedar shakes. Aluminum and steel roofing material is usually coated with Kynar, a plastic coating, comes in a variety of colors that should suit every homeowner and with enhanced energy ratings. Metal roofing weighs in at 0.5 lbs. per square foot for aluminum to 1.5 lbs. per square for steel. Compare this to a weight of 7.5 lbs. per square foot for tile and 9 lbs. per square foot for concrete roofing products. It is the low weight per square foot that allows for the installation of metal roofing over multiple layers of shingles. With metal roofing material, it will not be necessary to reinforce the roof rafters to carry additional load. Metal roofing material is generally formed into multi-shingles and sheets. This makes the installation very efficient and results in a generally lower cost per square. Speed of installation is also advantage in the fact it means that your home is not left unprotected for extended periods of time, lessening the potential damage caused by unexpected rain. Although the vast majority of metal roofing is sold in sheet form, you can purchase the product as individual shingles, as shown in Figure 6. 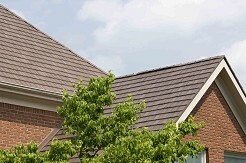 Individual shingles are very easy to install, however the installation time is extended as each piece must be placed in position and nailed separately. Metal is inherently a noncombustible material and hence has the most resistant fire rating available - Class A. Because of the Class A rating many insurance companies offer discounts on home fire insurance when metal roofs are installed on a home. It is worth noting that the fire classification of the material is not necessarily the fire classification of the entire roof. The roof will be fire rated based on all the materials present, including old cedar shingles, if they are under the new metal roofing material. Radiant heat from the sun is reflected off metal, which in turn reduces heat gain in the summer. The R-value of raw metal is low. However, many manufacturers have added foam and other insulation to the bottom of the sheets as well as creating an installation method that sandwiches air between the metal sheet and the deck of the roof increasing the R-value substantially. Metal roofing can generally be installed on any roof that has even a relatively low pitch, most manufactures want a minimum of a 3 in 12 pitch. If your roof has a low pitch; check the specific manufacturer's product data sheet to ensure that the material will work properly for your home and that the warranty will be honored. Many people believe that metal roofs are noisy when it rains. This is not true. If the roof is installed properly, metal roofs are as quiet as a shingle roof.